A beauty November Bull Trout. 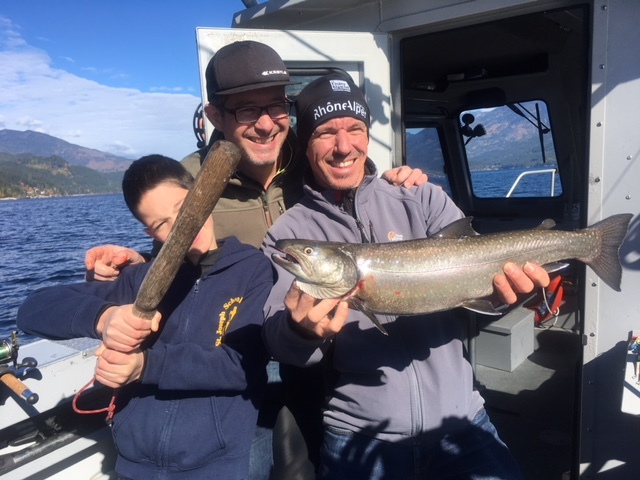 After experiencing our second phase of summer in the last couple weeks of October, we’ve also been experiencing some great fishing. The 10 days of 20 degree weather was a bonus and we were lucky enough to take advantage of it. October was a great month for fishing. The weather was fantastic, after the fist couple weeks, and the fishing was good as well. 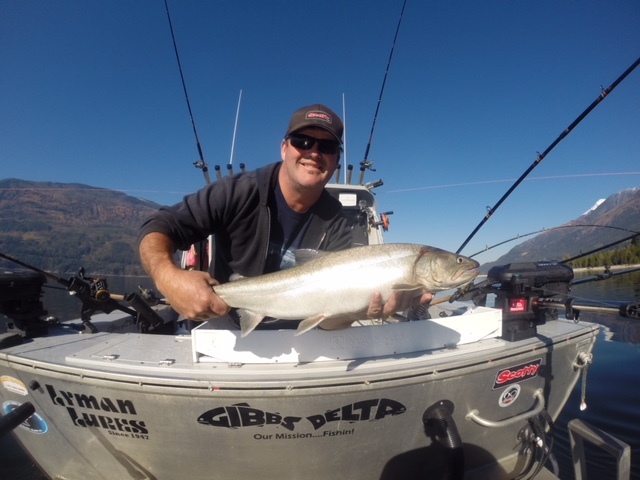 It seemed that there were more Bull Trout available to catch after mid October and it kept our groups busy. Rainbows were fairly active for the first half of the month, but have tapered off a bit now. However, the Bull Trout are still feeding fairly actively. Most days lately we have been averaging between 10 -15 fish. 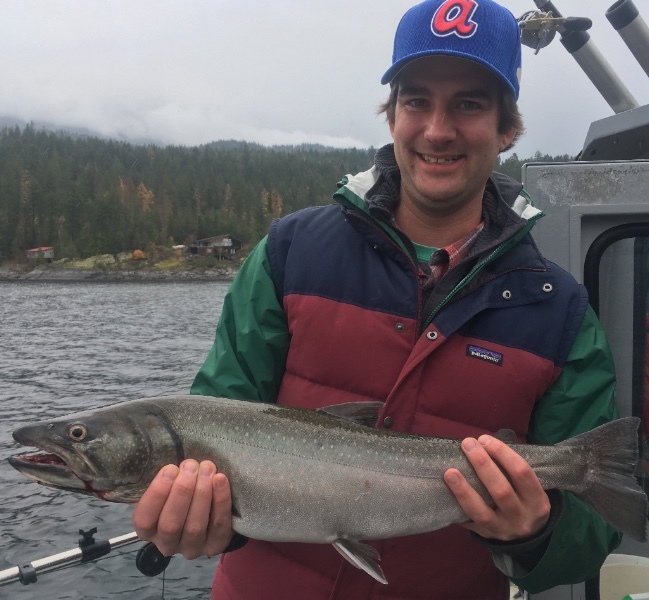 Rainbows between 2 – 5 Lbs and Bull Trout between 2 – 8 Lbs have been the norm. As always, I expect November and December to be prime fishing. With the amazing weather near the end of October, we managed to get out a few times on the river. The fishing was good for both Rainbows and Walleye. The Rainbows were even biting on the dry flies, which made it exciting. 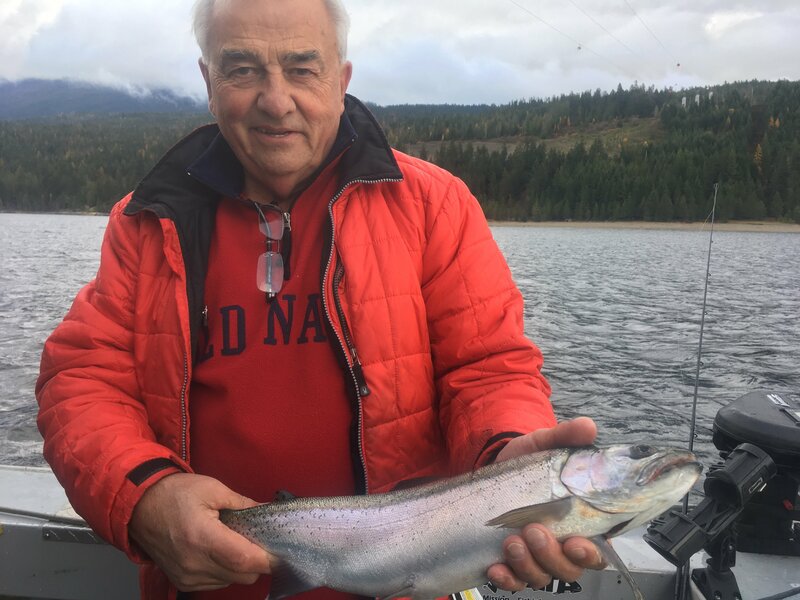 Most Rainbows were the usual Columbia River size of 2 – 4 Lbs, but we did manage a couple around 5Lbs. And the Walleye were averaging a bit smaller, coming in around 2 -3 Lbs, but making for some tasty meals. Spin casting and fly fishing continue to work for either species. Still hoping to get out a few times each month on the river. Stay tuned…. On the lake it’s been the usual. Bucktail flies, croc spoons, hockey sticks, and flasher/hoochie have all been working. Rainbows mostly on flies and spoons. My favourites have been the 215, 210, 226 for flies. And my favourite Gibbs/Delta croc spoons in the brass/fire stripe, or brass/fire wing have been working best. And the Bull Trout have been aggressively taking the flasher/hoochie combo. My favourite flasher is the Green Lemon Lime down around 100ft and it has been producing many. And on the river, its been a mix of dry flies and or nymphs on the fly rod. Or the usual jig head with a curly tail grub for walleye, and an assortment of croc spoons for the Rainbows.